HipHoops are fitted from high-grade, polyethylene plastic, then hand-wrapped with specially designed cloth tape. Their large size and heavy weight makes for easy maneuverability, while cloth tape provides additional friction. Those who may never have been able to hula hoop as children are surprised and delighted at the ease with which they are able to keep HipHoops airborne. The large size of the hoop is also a factor in successful movement. Generally, the taller the person, the bigger the hoop. Standard HipHoop size accommodates most adults of more or less average weight, with heights from 5’2 – 6’2. 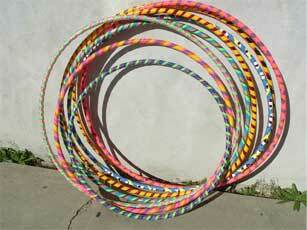 The Hoop Grande is for taller, more robust body types. Child Size is for children 12 and under. No child should ever do above the neck hoop tricks with an adult size hoop. HipHoops has over 15 designs available, plus personalized hoops with names and messages. HipHoops takes great pride in the quality of our construction – each hoop is carefully and lovingly hand-crafted by a hooping expert who has personal experience with the right ingredients for hoopness. And hoop bliss. Experience unlimited hoopiness with HipHoops! Copyright 2005 HipHoops. Design by Pigeon Industries.